This week on Creative Space, I visited a fabulous little gallery in town - the Art Cottage. This week on my Creative Space column, I featured artist Robin T. Milne - her work is wonderful! I love needlefelting for lots of reasons...it's easy, fun, stress-relieving...but mostly I love it because it's like painting with wool. I used a stencil to mark the butterfly outline on the felt, then I just started placing strands of wool inside to create a multi-color effect on the wings. I accented the butterfly with embroidery, then assembled the pillow with a second piece of felt and closed in some stuffing with a blanket stitch. I'm writing a new weekly column on our local news blog here in Concord, California. Creative Space will highlight local creative people, places and events...celebrating art, craft and performance. I'll also share creative projects and stories that I hope everyone in town and out of town will enjoy. My first and second posts were lists of some really fun ways to bring more creativity into your life...click and enjoy! 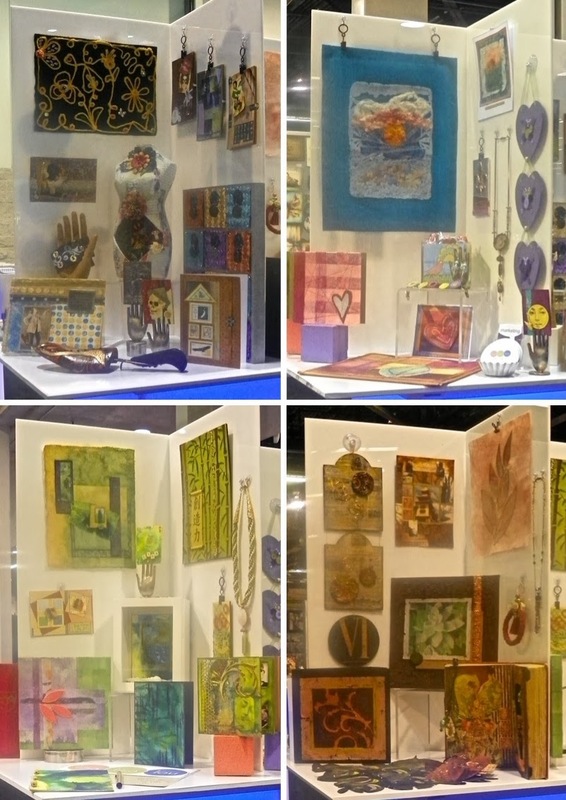 I've been attending the CHA show for many years now, but this past weekend was the first time I exhibited my art and craft work in the Designer Showcase. They just upgraded it so looks more like an art gallery setting; each designer gets their own pedestal table in a large space on the main show floor. I decided to have two custom 30"x30"acrylic panels made that slot together into an X shape, which divided my showcase pedestal (36" square) into four sections. Then I grouped my pieces together by color in each section. I sort of ended up with four mini-showcases in one! The purpose of the Designer Showcase is to highlight designers' work for manufacturers, publishers and the press to view and consider if they might like to work with a designer in some capacity. We shall see what new opportunities might come from it for me this year! Click here to watch a quick little video I shot of my showcase, and click here to see more of my pics from the CHA show, including shots of several other designers' showcases. So much amazing talent under one roof, yowza!! Some serious CHA swag and a GIVEAWAY! Manufacturers set up basic booths and elaborate exhibits at the annual Craft & Hobby Association Mega Show so they can show off all their products to resellers, creative professionals and the press. Within that category of creative professionals are all of us designers and bloggers who love crafting...especially with products we love or haven't tried using yet. I didn't get to see everything at this show because I picked up a nasty flu bug the last two days. But I enjoyed plenty of crafty fun and networking during the first three days, for sure! FaveCrafts hosts an amazing event at the show, where they bring bloggers, designers and manufacturers together at a cocktail party to mingle and schmooze. The manufacturers provide generous amounts of swag for us to take home...and word has it, even more swag is being shipped to us directly. It was a really great party! Plaid and I Love to Create each hosted lovely events for us too, filled with more swag! Plaid served a yummy breakfast in their booth and gave us lots of private time to chat with their designers and see things up close and personal. ILTC had a fabulous spa party, complete with sangria, massages, makeovers and a photo shoot. CHA held a Designer Product Preview before the show opened, where manufacturers could set up a demo table and give out samples of their newest products to designers - we do love a good sneak peek! And then of course, there are all the classes and make-n-takes to enjoy during the show, where you can bring back lots of samples and great project and technique ideas. I posted more pictures from the show on Facebook and on Pinterest if you want to have a look. Many thanks to all the very generous manufacturers who certainly made this designer's day quite a bit brighter! Now for the giveaway!! 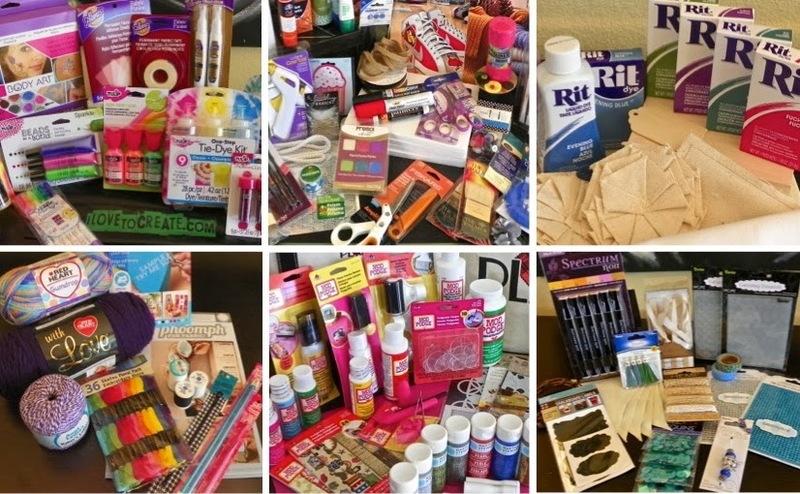 Swag is made for sharing...I'll put together a lovely random assortment of some of these products in a flat-rate USPS box to mail to one lucky winner - enter by 1/21/14 and good luck! So I have this collection of about 25 vintage single shoe forms that I bought from one of my roommates many years ago when she was getting ready to move abroad. They're really very cool to look at and imagine inside what kind of shoes they once sat, and who the person was that walked in those shoes. Then I got a hold of these Magic Marble inks - I'll be demonstrating with them in the Smoothfoam booth at CHA this weekend. After practicing the technique of dipping Smoothfoam balls into the inks, I decided to kick it up a notch and dip a shoe form! I used red, black and yellow inks, then after it was dry, I painted a swirly streak along one side with metallic glass paints. I used a small brush to tap texture into the gold paint that I filled into a black outline. I added some quick tester gems that I will replace soon with nicer Swarovski crystals. I think it turned out pretty cool! Today is the first Monday of the month, which means it's time for a Designer Crafts Connection blog hop. Just click on the DCC logo here in my sidebar to hop forward or back to the next blog. Then look for the logo on their sidebar to continue on.